Home Mobile Applications 10 best English to German dictionaries and phrasebooks for Android! 10 best English to German dictionaries and phrasebooks for Android! German is one of the most popular European languages. Several countries use the language outside of Germany as well. It’s difficult to travel to that part of the world without running into the German language. It’s not easy to learn like most foreign languages. However, most travelers and vacationers only need a phrasebook or a dictionary to get by. You can always buy a real one. However, your mobile phone can do it better and more efficiently. We can help you find the good ones, though! Here are the best English to German dictionaries and phrasebooks for Android! Those wanting to learn German can click our best list of the best German learning apps just below! Dict.cc is actually by a German developer. Thus, it translates between English and German quite well. It also works with over four dozen other languages. Some other features include complete offline support, a simple UI, synonyms, an auto-search function, audio pronunciations, and more. We’re not a fan of the orange and yellow color scheme, but everything else about the app is excellent. The free version contains ads and the pro version doesn’t. Dictionary Linguee is another multilingual dictionary. It supports dozens of languages and German is one of them, of course. The app features an excellent, simple UI along with translations, example sentences, audio pronunciations, and a full offline mode. It can translate between almost any two languages it supports. It’s a rock solid app with plenty of functionality. It’s also entirely free with no in-app purchases or ads. English German Dictionary is an above average app. It’s a simple app that only translates between English and German. Some of the app’s features include offline support, pronunciations, a web search function, and it works with other apps and your clipboard. You also get antonyms, synonyms, and various word games for memorization. It’s an excellent choice for a quick trip or as a study aid. However, anything more than that and we’d probably recommend something else. This one is free with advertising. English German Translator is a very simple translation app. You put in words and it spits out a translation. You can also use your voice, images, sentences, and handwriting. That’s basically all this app does. It’s a simple translator that only works between German and English. The developer has dozens of other apps that translate between other languages. This one is entirely free with no in-app purchases. There are ads, though. We would’ve liked a way to pay to remove those. German English Dictionary is another, simple bilingual dictionary app. This one boasts over 170,000 words. That should be more than enough for a short trip. Some other features include offline support, a bookmarking feature, and a live search that guesses the words as you type them. The UI is a little crowded. You may need to squint on smaller displays. Otherwise, the app works perfectly fine aside from the occasional translation issue as reported by other users. It’s also free with no in-app purchases and ad support. Google Play Books (and similar apps) is a good app for this kind of stuff. There are tons of ebooks with German phrases, teaching methods, and stuff like that. They usually don’t cost a lot. 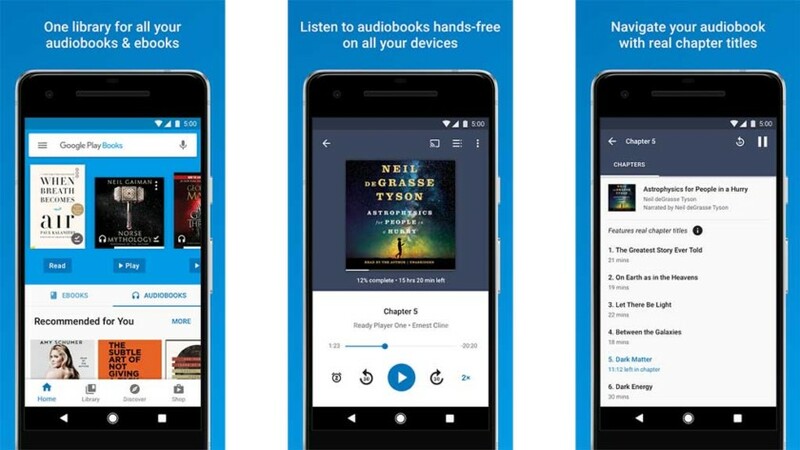 Plus, the app syncs your books between any device with your Google Play account. Amazon Kindle works as well if you use that. These apps generally have offline support, book searches, and simple user interfaces. They are excellent apps for this sort of stuff. Other apps may be better for quick use, though. Google Translate is probably the best app for this stuff. It translates over 100 languages online and more than 50 languages offline (typing only). It also features a camera mode for stuff like menus, signs, and other stuff. Additionally, the app can translate a two-way conversation in real time. That’s fairly impressive. It also translates whole phrases and contains definitions. It’s basically made for travelers and vacationers. It’s also free with no in-app purchases or ads as far as we can tell. Oxford German Dictionary is an above average bilingual dictionary. The UI is a little dry and clunky. However, it rarely affects usability. The app also features offline support, 520,000 translations, some search help functions, and more. We’ll be honest. The free version of this is fairly terrible. The apps aren’t great and most of the features are hidden behind the paywall. If you don’t intend on spending the admittedly exorbitant $19.99 for the premium version, then we recommend you pass. The premium version is quite nice, though. Reverso Translation Dictionary is another decent multilingual dictionary. It supports over a dozen languages and that includes German along with many other European languages. Some of the features include context examples, offline support, suggestions, and more. It also includes helpful stuff like flashcards for memorization and practice. There is an account registration required for a couple of the features. However, it’s otherwise a decent app. The free version has ads and the pro version doesn’t. Simply Learn German is an above average German phrasebook and learning app. It bills itself as a German learning app. However, it simply doesn’t have enough content to truly teach a language. It functions better as a traveler level phrasebook. The free version contains hundreds of common words and phrases. The premium version expands that. Some other features include audio pronunciations, some memorization games, and more. This along with Google Translate make a good one-two punch for travelers. Thank you for reading! Here’s more stuff to read! 10 best translation apps for Android! If we missed any great English to German dictionaries or phrasebooks, tell us about them in the comments! You can also click here to check out our latest Android app and game lists! 5 best Japanese to English dictionaries and phrasebooks on Android!